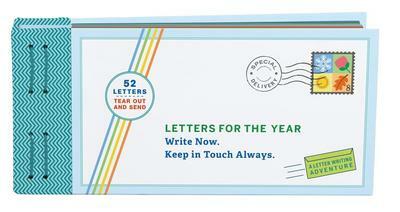 Letters for the Year: Write Now. Keep in Touch Always. Fair. Has a publisher's remainder mark. Book reads fine but has significant wear, dings, and jacket tears. Ships Within 24 Hours M-F-Satisfaction Guaranteed! Has a publisher overstock mark. Item is in Good Condition. Clean Copy With Light Amount of Wear. Acceptable. Used-Acceptable. Cards. Overall good condition with some wear. Has a remainder mark. Letters to My Grandchild: Write Now. Read Later. Treasure Forever. Letters to My Baby: Write Now. Read Later. Treasure Forever. Letters to My Son: Write Now. Read Later. Treasure Forever. Letters to My Daughter: Write Now. Read Later. Treasure Forever. Letters to Me, When I Grow Up: Write Now. Read Later. Treasure Forever.